It makes me sad to inform you that I have neither researched or fact-checked this article, so I will make personal shots instead of using facts and figures to make a substantive argument. This is in the hope that I am recognized as a left-leaning, intellectual journalist. But to help disguise that, I’ll try to make a story from pseudo-facts that are totally unrelated or make the title of this article taunting and misleading to help get some visits to this letter. Ever since Mr. Narendra Modi became Prime Minister in May 2014, our collective minds have stopped thinking and tirelessly working to discredit his government. We did not want a Right Wing party to come to power. All of our efforts over the years in trying to make that school of thought abominable have been in vain. We thought we could segregate the Hindu and Muslim community from ever forming a single votebank, but it did seem like some of them combined to vote in UP and in other parts of India. So, true to our mission, what did we do? We wrote opinions dissecting vote shares and how the entire communal Hindu force voted BJP to power all over India in the hope that the minority community elsewhere would not notice this little aberration. It’s almost like the big bad wolf dressing up as Red Riding Hood’s grandma inside the house. Our commitment to pseudo secularism, no matter how dire the situation is, will remain unequivocal. But I’ve noticed a little problem with us. We never attack Mr. Modi on his agenda, his policies. Okay, to be fair, we do. But how deep do we ever research and find out about what that particular policy is? All we care about is bringing down the man, not the policy, right? Remember the good old times when we couldn’t use 2002 or “not-so-impressive Gujarat track record”, so we went after Mr. Modi’s marriage? That’s the kind of stuff I’m talking about. WHAT ARE WE SUPPOSED TO DO NOW? People are becoming cleverer and thinking for themselves. These unwashed, ugly young males of India aka trolls as we call them (only when they ask us questions we don’t know answers to) have a serious problem with the media. They are not letting us have our freedom of speech on twitter and always have something reasonable and logical to retort when we make up a problem with the PM’s foreign visit. Just the other day, we all decided we would go ahead with Mr. Modi’s shawl this time, but these Social Media bullies stopped us in our tracks using facts! Luckily that’s just the adult population in this country. There’s a prime audience out there who are still waiting to be brainwashed with this same idea and who will volunteer to this process themselves! You know what I’m talking about! 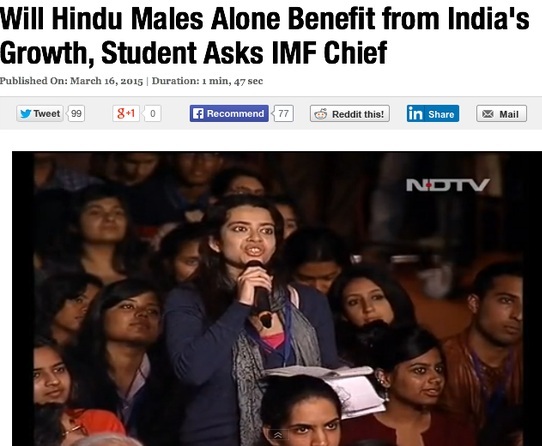 Lets’ follow NDTV’s example by collecting all the young college kids in New Delhi and feeding questions we would never ask ourselves and making them appear smart. Well, if it doesn’t work it doesn’t matter. It’s not like we would have to apologize anyway. We did that once, we can do that any number of times. But anyway, we have to do something about this rising evil out there that is going to stamp us out. My suggestion, in this little open letter, is to make all investigative and fact-checking journalistic activities shift to write-what-I-want-because-this-is-a-free-country kind of opinion articles, like this. Let me tell you why that works. All it requires is to sit in front of a computer and type it out without ever needing to go out there and find the truth. Plus, with all our awards and merits of journalism, some people will still believe whatever we want to say. I just noticed that a lot of people who share these links on social media, none of them even open the page to read about what the article is. They don’t have time or can’t be bothered, so they assume it all from the headline and pass an opinion from ours! Isn’t that great? That’s the true, independent thinking, intelligent young Indian we need as our audience. Let’s get more of them on twitter. In the meanwhile, let’s just make these titles as racy and misleading as possible.